If you haven’t already, please take our quick 1-minute tour here. Off2Class is organized around three main teaching functions A) Teaching Lessons B) Managing Students and C) Assigning Homework. In this article, we’ll provide you with an overview of each function so you can get teaching with Off2Class in no time. Off2Class is centered around lessons. Our English as a Second Language (ESL) Library contains over 700 (and growing!) lessons that are designed for you to teach live to your students. To find a lesson to teach, go to the Teacher Tab. There you’ll find lessons covering Grammar, Idioms, Listening, Speaking, Vocabulary, Reading, Business English, Functional Language and IELTS. You can browse the library or use the search function to find lessons to teach. 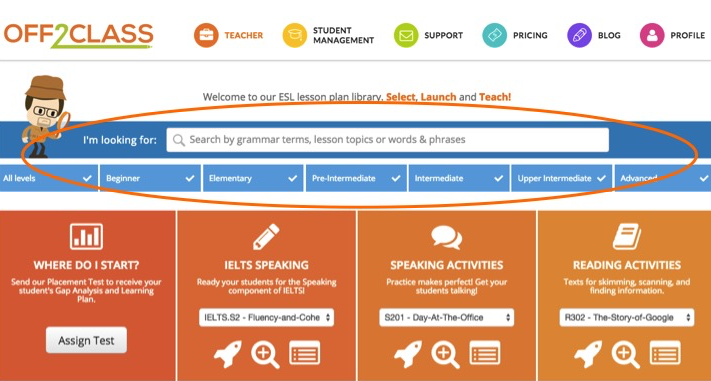 Whether you’re browsing or using the search function, the level filters (just under the search bar) will help you find a lesson at the appropriate level for your student. If you don’t know what lessons to teach your students, you can send them our Placement Test. Your students will take the assessment and you’ll get their Gap Analysis and Individual Learning Plan back to you. Once you’ve launched a lesson, you’re in the Off2Class Classroom and ready to teach. Make sure you Enroll your students into the classroom when we prompt you. Each lesson comes with Lesson Content on the right and adjoining Teacher Notes on the left. Depending on how you are teaching, your students will join your lessons in different ways. Teaching Online – When you launch a lesson be sure to Enroll your students. If you’ve enabled the Class Enrollment Notifications on your profile page, your students will receive an email telling them that class has started with a button that will take them right into your classroom. 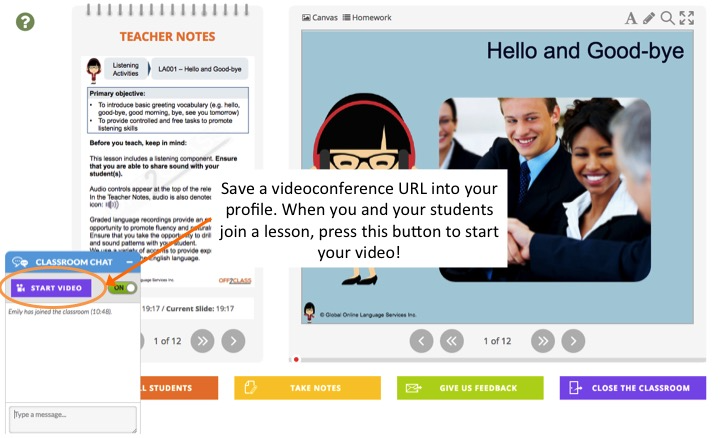 Now it’s time to launch your videoconference video so that you will be able to speak to and see your student. We integrate with any videoconference software such as Skype, Google Hangouts, Zoom.us, Go To Meeting or Wiz IQ. Once you launch your video, just be sure to minimize the video window so that you’ll be able to see Off2Class and the video simultaneously (please instruct your student to do so as well). It is also possible to play with your video window size and Off2Class browser size to view them simultaneously (depending on your screen size). A special note for students joining online lessons from a tablet or mobile device. Due to mobile operating system restrictions, it is not possible for your students to view Off2Class and a videoconference system simultaneously from a tablet or mobile. If your students would like to join your online lesson from a tablet or mobile you’ll need to use the screen sharing feature of your favorite videoconference system. Teaching In-Person (single-device) – For a one-2-one lesson you can physically share your laptop or tablet with your student and use it as the focal point of the lesson. For a classroom lesson, you can project your laptop or tablet using a projector, TV screen or Smartboard. Once you’re sharing (or projecting) hide your Teacher Notes by using the Full-Screen button on the top right of the classroom (this pops up the notes as a separate window – close the pop up) and load the Teacher Notes on your smartphone. 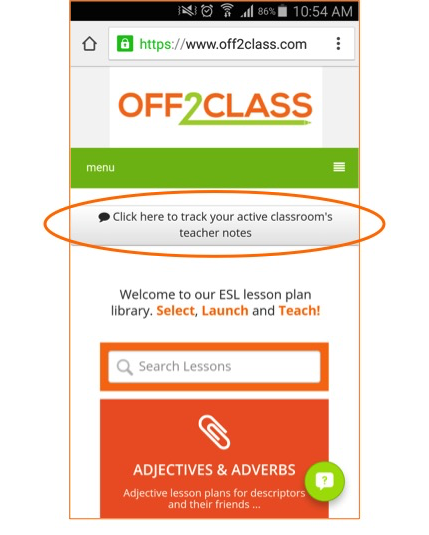 To load the Teacher Notes on your smartphone, use your smartphone’s browser to login to Off2Class (same login credentials) and you’ll be prompted to ‘track your active classroom’s teacher notes’. Please Note: If you’d like to disable the classroom chat for your lessons you can do son your profile settings. This can be especially useful if you are teaching lessons to Young Learners or in a large group setting. 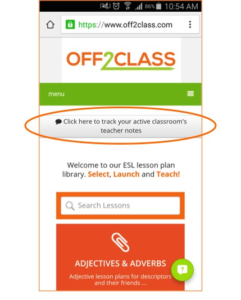 Off2Class is designed to make managing your students’ ESL learning easier. We can save you hours managing your students. To manage your students go to your Student Management Tab. The first step is to Add Students. When you Add Students to Off2Class you pick a nickname and password and add their email address. Don’t worry, we will never send your students emails (the exception is if you choose to use homework notifications) and we will never send them anything promotional. We don’t even send them their log in credentials. We send them to you by email, and it’s your choice of how you want to share them with your students. 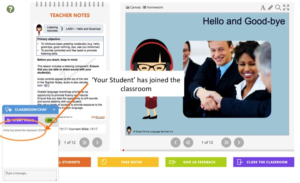 Once your students are added, every time you launch a lesson, you’ll be prompted to Enroll your students. Be sure to Enroll the student you are teaching that day, and you’ll then be able to track their lesson history, take notes on their performance and assign them homework at the end of the lesson – all within the classroom. Once you’re in the classroom you can Take Notes on your students by using the yellow Take Notes button. The next time you launch a lesson and Enroll this student, the latest notes you’ve taken on your student will pop up as a teaching reminder. You can also access the entire history of notes you’ve taken on your student from your Student Management Tab. You can manage your students on your Student Management Tab. When you click on a student’s name, you’ll be able to see the notes you’ve saved about your student and a table that lists their lesson history and allows you to assign, open and manage homework assignments (lesson history table). By clicking on Student Info & Settings you can manage your student’s account info and settings (such as login information). You’ll also be able to deactivate the student if you aren’t teaching them anymore (deactivating pauses the student but doesn’t erase their history). If you’d like to permanently delete the student you can also do so by clicking on Student Info & Settings. If you’d like to see what your student sees when they log in to Off2Class, click the button (under their avatar) that says “Log in as your Student”. You’ll be taken into their account and you’ll be able to see all the functionality of Off2Class as if you were logged in as them. Assigning homework is one of the nicest features of Off2Class. After you teach your students lessons, you can automatically assign them homework and provide them with lesson summaries. When teaching lessons, be sure to Enroll the student you are teaching that day (when we prompt you). If you Enroll your students, at the end of the lesson we will ask you if you want to assign them the corresponding homework and will provide them with an email notification of the assignment. We will also send them a lesson summary of the lesson you just taught them. 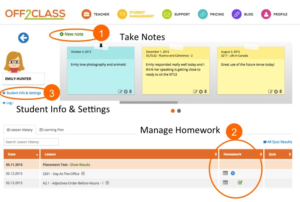 When your student logs in to Off2Class (using their email address and the password you set up for them) they’ll be able to complete their homework, view their lesson summaries and review their submitted homework assignments. 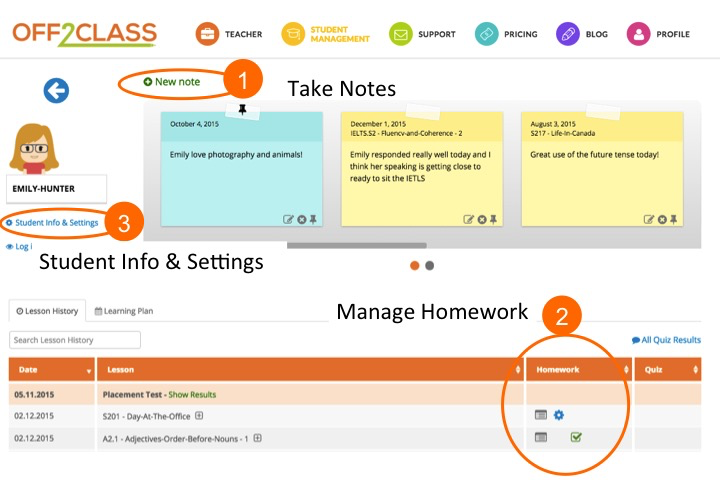 Once your student submits a homework assignment you’ll be able to open their completed homework from your Student Management Tab. Just click on the relevant student’s name. 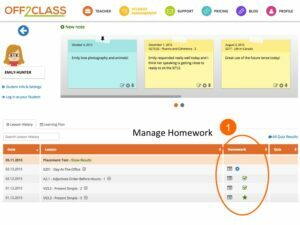 You’ll see a table that outlines their lesson history (lesson history table), and for each lesson, you can assign, open and manage homework assignments from the Homework Column. Once you launch their homework you’ll see their answers on the right and a copy of the answer key on the left. You can leave them feedback on their assignment using the notepad on the right of the screen. When you close their homework assignment, we’ll ask you if you want to mark it as Reviewed or Not Reviewed. If you mark the assignment as Reviewed, the student will get a copy of the Answer Key when they open the assignment from their panel.